It would be so simple if practice owners could open a fortune cookie for each one of their employees and find the method by which to fairly compensate them. While there are commonly accepted methods of compensation, their implementation in veterinary practices varies because different entrepreneurs have different business goals. Also, “fairness” is a relative term that introduces variability into an equation that might otherwise be consistent from practice to practice. This article describes the factors that practice owners should consider when determining compensation for veterinarians and paraprofessional staff. Paraprofessionals are often compensated on an hourly basis and the industry has yet to develop widely adopted performance-based compensation models. Paraprofessionals generally report low job satisfaction and high turnover rates. In the 2016 NAVTA Demographic Survey, 38% of veterinary technicians left the practice due to insufficient pay, 20% due to lack of respect from an employer, 20% from burnout and 14% because of the lack of benefits. Full time technicians reported a salary between $15-20 per hour, while part-time technicians reported $14-16 per hour. After taxes, even the well-paid veterinary technicians are only slightly above what is considered the poverty line for a family of four in the United States ($24,300). According to the United States Bureau of Labor Statistics, the median pay for veterinary technicians was $16.06 per hour in 2017. By comparison, a JAVMA published study on Jan. 1, 2016 of certified veterinary technician specialists reported that the weighted mean pay rate in 2013 was $23.50 per hour. In AAHA’s 2016 Compensation & Benefits survey, average veterinary employee turnover was 21%. 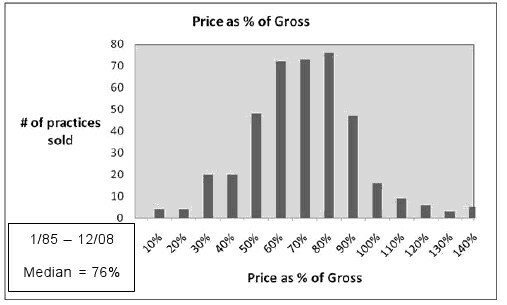 In Veterinary Economics 2010 Benchmarks survey of Well Managed Practices, turnover was 26% for receptionists, 21% for assistants, and 44% for ward attendants. To compare with the national workforce, Compdata’s Annual Compensation Survey showed that national average turnover was 18.7% in 2008 and 15.9% in 2010. 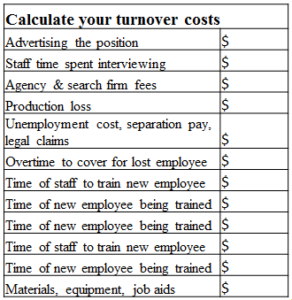 The chart above can be helpful to calculate a practice’s turnover expenses. Turnover is a pervasive and expensive problem that can be mitigated by learning how to properly motivate employees.